Lets just relive these jacket-free moments captured oh so perfectly by my good ol’ pal, Joey. You know him, he’s been the one taking all of the epics shots in my last few posts! Because the cinched waist sits strangely on me, I paired the dress with a thick brown belt to help accentuate the waist line and help smooth out those curves. The oxfords I’m wearing are SUPER old but still holding up. I got them at Aldo. 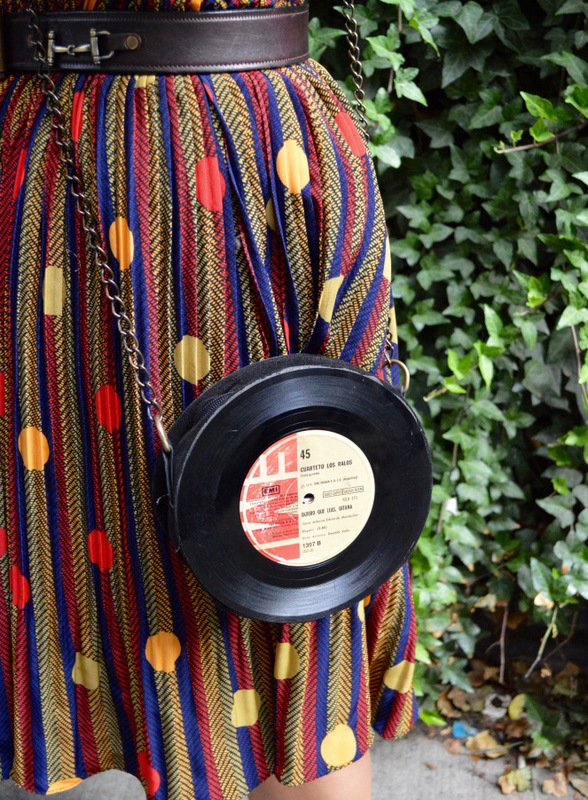 The super cute bag made out of vinyls!? I know, I’m obsessed too. It’s one of the most complimented pieces I own! Snagged it at the Housing Works Thrift Shop on Broadway & 96th, and it’s made out of LPs. Joey and I spent the rest of the day wandering around SoHo popping into stores and pretending like we could afford everything & anything. In reality, I had about $5 to my name so we stopped at the Housing Works Bookstore Cafe for coffee and some cheap reads and grabbed some cheap dumplings and bubble tea nearby. The weather was peeeerfect, and as expected, Joey captured me looking as happy as a clam in this new, whimsy dress of mine.